Load power supply module is used to convert AC 220V power supply DC 24V, for use by the CPU and I/O module and other modules. Backup battery in the PLC is the role of power, to ensure the normal operation of the real-time CPU clock, and you can save a user‘s programs and data (in RAM). Some lower-end CPU because there is no real time clock, there is no backup battery. 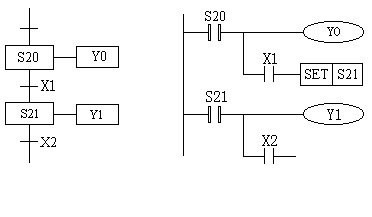 CPU outputs a DC 24V,L+ DC 24V anode and cathode respectively and m. Can be used as a CPU switch signal input or external power components. Mode selector switch used to select the operation mode of the CPU. The switch is a key switch, altering the way it needs to insert the key to prevent unauthorized people from changing the CPU operation mode. (4) the MERS (MEMORY CLEARED) location: can reset the memory, the CPU back to the initial state. This position cannot be maintained, when after the release and return to the STOP position. (7) the BUSF (bus fault indication, red): Profibud-DP interface to hardware or software failure is often light. Memory card when the electricity was used to save user programs and data, you can extend the storage capacity of the CPU. MPI interface for CPU and other PLC, PG/PC (PG/PC), OP (operator interface) via MPI network communications. Front connector is used to connect sensors and actuators to the signal module, front cover (9). When the first redundancy fault-tolerant S7 connection is lost, the h CPU operating system called OB73 (fault-tolerant only S7 communication S7 connection) if other fault-tolerant S7 connection redundancy is lost, then there will be no more OB73. Until for all S7 connection is restored after redundancy with fault-tolerant features, will there be other OB73. If there is a launch event and OB73 no programming, CPU not to STOP mode. Whenever error executing OB, S7-300 CPU operating system called OB80. Such errors include: beyond the cycle time, implementation of the OB appears to confirm that the error startup time, ahead of time, and OB is skipped, CiR recovery RUN mode. For example, if, after a previous call to the cyclic interrupt OB started event, while the same OB remained in place at this time, the operating system will call OB80. If OB80 has not been programmed, the CPU will be converted into STOP mode. You can use SFC 39 to 42 disable or re-enable time delays and errors OB. As long as the event that triggered by error or malfunction occurs, and this error or fault with the power supply (only on S7-400) or backup battery (when entering and leaving), S7-300 operating system call CPU OB81. In the S7-400, if the battery test function has been activated using the BATT.INDIC switch, only OB81 is only invoked in case of battery failure. If OB81 without programming, the CPU is not to STOP mode. You can use SFC 39 to 42 disabled or delayed, and re-enable the power error OB. If the module has a diagnostic function (for which you have enabled diagnostic interrupt) error is detected, it will output a diagnostic interrupt requests to the CPU (when entering and leaving). The operating system called OB82. OB82 local variables contain the logical base and four–byte module fault diagnosis data (see table below). If OB82 has not been programmed, the CPU to STOP mode. You can use SFC 39 to 42 disabled or delayed, and enable diagnostic interrupt OB again. Can use SFC 39 to 42 delayed insert/enable/disable/delete interrupt OB. SFC 39 to 42 can be used to disable CPU hardware error or delay OB, and then enable it again. 1, OB not yet loaded (except for OB81) initiated the event. 2, the operating system error accessing the module. 3, the system image I/O access errors occur during the update process (if configuration reasons, does not prohibit OB85 calls). As long as the distributed I/O (PROFIBUS DP or PROFInet IO) was detected in the Central extension frame (without the S7-300), the DP master station or station (when entering the event and leave events), the CPU operating system called OB86. If OB86 has not been programmed, when this type of error has been detected, CPU to STOP mode. Use SFC 39 to 42 disabled or delayed, and re-enable the OB86. As long as the event that caused by a communication error occurs, CPU operating system called OB87. If OB87 has not been programmed, CPU not to STOP mode. You can use SFC 39 to 42 disabled or delayed, and re-enable communication error OB. Failure to OB 88 programming and program execution is aborted, the CPU enters STOP mode (event ID W#16#4570). If you suspended the program priorities 28 block is executed, the CPU enters STOP mode. By SFC 39 to 42 disabled enabled, delay and interrupt OB. As long as the same process–related errors in the event, CPU‘s operating system is called OB121. For example, if a user called has not been loaded into the CPU block, will be called OB121. As long as access to module data error, CPU‘s operating system is called OB122. For example, when you access data on the I/O module, CPU read error is detected, the operating system calls OB122. The main class is one of the programmable logic controller and module difference was S7-200 belonging to the basic entry level, while S7-300 and S7-400 relative to the use of higher-end. 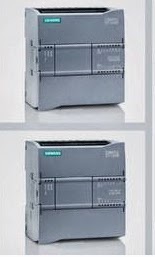 Siemens plc is the serial number of the product. —->S7 400: used for large scale control system, mainly redundancy control. 200 belongs to small machine, 300 belongs to medium machine, minicomputer is multifunctional machine, will all function combined in with, it of control scale for maximum 512 points, CPU of operation processing speed than in the mainframe fast, minicomputer more for overall type of, extended module up can added 8 block, applies Yu small equipment, price high; in the mainframe structure is module of of, up can added more than 300 more block extended module, in the mainframe hardware more your, cost high, but its operation processing speed fast, has is strong of communications function, Mainly used in large-scale production line, such as the chemical industry, paper industry, steel industry, car production line, air conditioning, sewage treatment, and mainframes in the Siemens 300 and 400 in China, Siemens stable performance, network communication is powerful, simple, and cost-effective. (1) major S7-300/400 more modular, S7-200 series is integral, CPU module, the I/O module and the power supply module in a module, called CPU modules and S7-300/400 series, from the power supply, I/O,CPU is a separate module. But that misleading 200 series cannot be extended, in fact, 200 series can also be extended, bought the CPU module is integrated with the merely functional, some smaller systems do not require additional custom modules, 200 series modules also have signaling, communication, control and other modules. (2) to rack 200 series no concept, called Guide; in order to facilitate control, 300/400 series module was mounted on a rail, called a rack, is an extended frame corresponding to the Central rack, rack also is reflected in the software. (3) on the same rack 200 series module by module directly above the data connectors contacts; and 300/400 are at the bottom of the u–bus connector. (4) 300/400 series I/O input is connected to the front connector on the, on the module front connector attached to the signal, and is not directly connected to I/O signals on the signal module so that you can replace signaling modules without rewiring. (5) 300/400 series CPU with PROFIBUS (PROFIBUS is an international. The open. Not dependent on the device manufacturer‘s field–bus standard) interfaces. (1) STEP7-Micro/WIN32 for 200 series software 300/400 use STEP7 software, with the Micro and without the difference is quite obvious. (2) there are three programming languages—of the 200 series statement list (STL), ladder diagram (LAD), function block diagram (FBD); 300/400 series in addition to the three, but also has structured control language (SCL) and graphic language (S7 graph). (3) 300/400 software features provide a number of blocks of data to each functional block (Block-FB), called Instance. (4) 300/400 can’t feel free to customize the Organization Block and the sub-routine and Interrupt routine, now the OB1 self-centered, nothing the system will call it, the rest of what became FB-Block and FC-, others are predefined system, System s to them (SFB and the SFC) defined his identity. (5) 300/400 are provided in the accumulator (ACCU) and status word register, Diagnostics buffer. This entry was posted in plc program and tagged Learn PLC programming, plc, plc basics, plc courses on June 13, 2016 by arco. Using local variables DWORD LD20 as a pointer, the pointer address is P#4.3. Statement form can be INDIRECT when the status monitor (indirect) pointer address LD20 4.3. M [LD 20] corresponds to the actual address is M4.3. 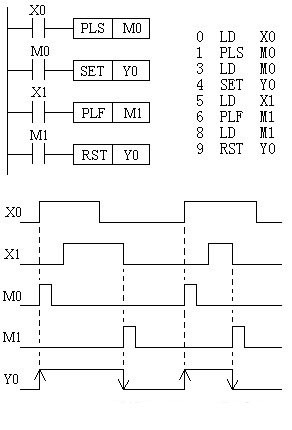 If to using clock pulse, first to selected “Clock Memory’ (clock memory) option, then set clock memory (m) of byte address. assumed set of address for 100 (that MB100), has Shang table known, M100.7 cycle for 2s, if with M100.7 of often open of touch points to control Q0.0 of coil, Q0.0 will to 2s of cycle flashing (bright 1s, out 1s). “OB85-Call up at I/O access error“ changes to the system used to set CPU process image I/O access errors that occur when the response … If you want to call OB85 when an error occurs, it is recommended that select “Only for incoming and out going error“ (and only errors disappear), as opposed to “On each individual access“ (individual access), Does not increase the scanning cycle time. Method two: write your own delay procedures and set the delay time, when the time comes when executing a stored procedure call, which under the influence of program cycle time, is not particularly accurate, if it is under less stringent conditions this method can be used. Method three: using interrupt organization block break on to achieve, such as in OB35 calls a stored procedure, implement store, this method is more accurate. Method five: interval such as if you use an external trigger signal, also by means of hardware interrupts. PLC communication module is used to complete with other PLC and other communications between intelligent control device or computer. Following simple FX series communication function expansion board, adapter and communication modules. 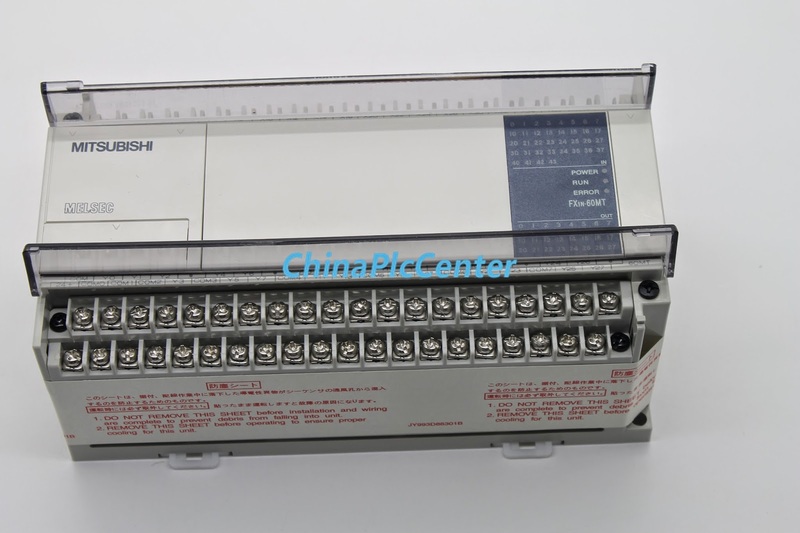 (1) communication standard connection expansion board FX2N-232-BD FX2N-232-BD is RS-232C transmission PLC interface with other equipment. Such as PC, barcode readers or printers. Can be installed inside the FX2N. The maximum transmission distance is 15 m, maximum baud rate for 19200bit/s, PLC running status monitoring using special software, and can also be transmitted from the PC to the PLC program. (2) traffic on the interface module FX2N-232IF FX2N-232IF connected to the FX2N series PLC can be achieved with other devices with RS232C interface for full–duplex serial communications. For example, PC, printers, bar code reading and so on. FX2N series FX2N-232IF modules can connect up to 8 blocks. Use the FROM/TO command to send and receive data. Maximum transmission distance of up to 15 metres, maximum baud rate for 19200bit/s, occupying 8 I/O point. Data length and serial communication baud rate can be set by a special data register. (3) expansion board FX2N-485-BD FX2N-485-BD-for RS-485, as a way of communication. It can be applied to data transfer without agreement. FX2N-485-BD at the time of the original agreement, as a way, using RS instruction in personal computers, barcode reader, printer, data transfer between. Transmit the maximum transmission distance of up to 50 metres, maximum baud rate for 19200bit/s. Each of the FX2N series PLC can be fitted with a FX2N-485-BD Communications Board. Apart from the use of this communication Board communication with the computer, but it can also be used to achieve two parallel between FX2N series PLC. (4) communication expansion board FX2N-422-BD FX2N-422-BD to RS-422 traffic. 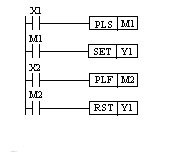 On the connections of the FX2N series PLC, and as a tool for programming or control a port. This interface is available outside of the PLC connected to PLC devices, data storage unit, and human-machine interface. FX2N-422-BD can be used to connect two data storage unit (DU) or DU–series unit and a programming tool, but one can only connect a programming tool. Every basic unit can be connected to a FX2N-422-BD and cannot be used with FX2N-485-BD or FX2N-232-BD. This entry was posted in plc program and tagged Learn PLC programming, plc basics, plc courses on June 12, 2016 by arco. 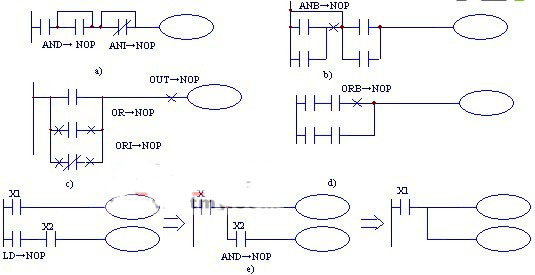 NOP instruction for no operation, mainly used for short circuit, change the circuit functions and procedures to use when debugging. Added to the program after no operation, no effect on the results of logical operations, but when the program is changed in the future, replaced by other directives no operation, can reduce the program changes. If no operation replace LD, LDI, ANB, and ORB directives, circuits will be more substantial changes, care must be taken. This entry was posted in plc program and tagged plc basics, plc courses, PLC ladder, PLC ladder diagram on June 12, 2016 by arco. ANB multiple instruction block instruction “and“ operation. ORB multiple instruction block instruction “or“ operation. “Example 1“ press the button X0 or X1, X2 or X3 then press the switch at the same time, bright led Y1. This control requires control ladder diagrams and instructions as shown in the table as shown in Figure 1. “Example 2“ press the switches X0 and X1, or when you press the switches X2 and X3, led Y1. 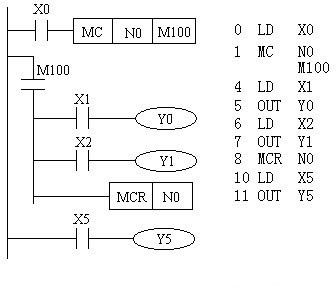 This control requires control ladder diagrams and instructions as shown in the table shown in Figure 2. This entry was posted in plc program and tagged Learn PLC programming, plc basics, plc courses, plc programming examples on June 11, 2016 by arco. Is designed for step instructions designed for sequential control instruction. Many control processes are available in the industrial control field controlled manner in order to achieve, using the step instruction sequence control is convenient and easy to read modify. FX2N has two step instructions: STL (stepping contact instructions) and RET (stepping back). STL and RET instructions only with the State s to get with step function. STL S200 for normally open contacts, called STL–contact, which in the ladder diagram symbols as it does not normally closed contact. We use for each State s record a step, STL S200 (ON), then enters the S200 represents a step (similar to the master switch), began implementation of this phase of the work of, and determine the conditions for entering the next meet. Once this signal is ON, then turn-off S200 to enter the next step, such as S201. Instruction is used to reset the STL RET instruction. After executing the RET will be back to the bus, exit the step. A sequence control process can be divided into several stages, also known as step or status, each State has a different action. When transitions between two neighboring States when conditions are met, it will be converted, that is performed by the previous state to the next State. We use state transition diagrams (the function diagram) describes this process of sequential control. As shown in Figure 1, each State s with a State record, x for the conditions. When X1 is ON, the system state S21 S20. Each step in a State transition diagram contains three elements: the step–driven content, transfer conditions and instructions change objectives. S20 driving Y0 in Figure 1, when ON is X1, then the system state S21 S20, X1 conditions for conversion, convert to S21. 6) within the interrupt routine and subroutines, you cannot use the STL instructions. (1) INV (against orders) after the implementation of the directive will be operated are negated. Anti-instructions of use as shown in Figure 1, if X0 broken, Y0 is ON, or Y0 is OFF. Use INV cannot like repertoire of LD, LDI, LDP, LDF and bus connections, nor as instruction sheet OR, ORI, and ORP, ORF instructions separately. (2) the NOP (no operation) does not perform an action, but a program step. Execute the NOP does not do anything, can sometimes be shorted some NOP instructions contact or NOP instructions the instructions do not cover. When the PLC after you do the clear user memory user memory contents become no operation. (3) END (end of instructions) show the end of the program. If the end does not write END directive PLC however long the actual user program, are performed from the user program memory, the first step to the last step if the END directive when scanning at the END, the end program execution, which can shorten the scanning cycle. While the program is debugged, several END instruction can be inserted in a program, the program is divided into several sections, in front of the identified program is correct, delete the END directive in turn, until the end of the debugging. Stack instructions are the new FX series basic instructions, for multiple output circuit for programming convenience. Has 11 stores in the FX series PLC modules are specifically designed to store the intermediate results of the program, known as the stack memory. 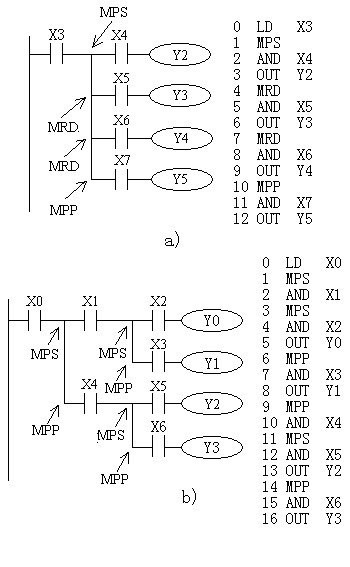 (1) the MPS (stack instructions) the results into the stack memory in the first paragraph, while previously sent data in order to stack the next paragraph. (2) the MRD (read stack instructions) will stack the first piece of data storage (finally push data) read out and the first paragraph of the data saved on the stack memory, stack‘s data does not move. (3) the MPP (stack instructions) will stack the first piece of data storage (final push of data) read out and the data disappears from the stack, while other data in the stack moves up in turn. Stack instructions use is shown in Figure 1, Figure 1a for a layer of the stack, into the stack information for unlimited use, last use the eject signal MPP instructions; figures 1B two–story stacks, stacks of it with two units. 3) because the stack of which is only 11, so level up to 11 layers of the stack. (1) PLS (rising differential instruction) on the rising edge of the input signal produces an output pulse scan cycle. (2) the PLF (falling edge differential instruction) on the falling edge of the input signal produces an output pulse scan cycle. Differential instruction of use as shown in Figure 1, using differential instruction signal edge is detected through the set and reset commands to control the Y0. 2) when using PLS, only driven within one scan cycle of the input ON the target device ON, as shown in Figure 3-21, M0 X0 only normally open from off to ON when a scan cycle; use the PLF command only when driven by an input signal falling edge, others with the same PLS.